I write articles for The University of Melbourne’s Pursuit. Basically Pursuit is an online platform that translates the latest scientific research into a relatable format for the everyday person. Everything from food and nutrition to psychology, archaeology and engineering. You’ll be amazed at what is happening in the world. Definitely check it out. Recently I was asked to write an article about the role of calcium on cholesterol production. That’s right, you read right: calcium and cholesterol, instead of bones and teeth. Okay before I continue (and I inadvertently set someone off into anxiety), let me make one point: Yes there are different types of fats including different types of saturated fats…and yes coconut oil does contain saturated fatty acids. The low fat diet from the 1960s and 70s led the charge against fat, all fats, including SFAs. While SFA traditionalists tend to hold fast to view that SFAs are the major causal factor for clogged arteries and heart attacks, modern-day SFA proponents tend to follow the line of thought that previous dietary recommendations promoting low/minimal SFA consumption is completely erroneous. The truth is fat metabolism and utilization in the body is a lot more complex than either lines of logic and will be discussed in another post. I promise. While a minimum of 10% SFAs contributes to the total energy intake of Australian adults, the National Health and Medical Research Council of Australia and The Heart Foundation recommends that saturated fat intake should be up to 7% of total energy intake. This is based on a substantial body of evidence (both epidemiological and clinical studies) that show an association between a high consumption of SFAs and an increased production of key cardiovascular risk factors: total cholesterol and low density lipoprotein (LDL, commonly called “bad cholesterol”) (Martin et al. 2012, Rees et al. 2013, Sun et al. 2015). Consequently dietary recommendations often promote consuming lean meats and low or fat-free dairy products. Before we continue, let’s take a step back. From a nutrition perspective, in order to work out the cause of a health condition (both good and bad), we have to first have a look at the food components of the diet – i.e. the types of food consumed. Using cardiovascular disease as an example, we may look at the dietary patterns between different population groups (e.g. dietary intake of different ethnic groups like Mediterranean populations vs. Australia or the USA; vegetarians vs. omnivores). For example, Rozin (2005) highlights the differences in dietary intake (and attitudes to food) between the French (smaller portioned meals containing olive oil, wine, unprocessed meats and modest amounts of cream, butter, cheese) in comparison to the USA (larger food serves high in processed meats, white breads, chips and soft drinks). From there, we then look at the nutritional composition of foods consumed. And based on these correlations we can work out relationships between dietary intake and health outcomes. However if we want to understand how these foods cause the actual health outcomes, we have to undertake mechanistic studies where we assess the action of individual components of the foods (e.g. milk – is composed of protein (different types), fats (different types), sugar (lactose), minerals (calcium, phosphorus etc.). This type of research is really important to work out “how” nutrient “X” causes health outcome “Y” by doing action “Z”. This data however needs to then be explained in the context of what we all actually eat: FOOD. While isolated nutrients may behave in a certain manner, we eat food – not individual nutrients. It is becoming more evident in nutrition research that not all foods behave the same way as our body does not always absorb the components of food in isolation. In order for nutrients to become bioavailable (i.e. absorbed and able to exert an action), they must first be bioaccessible (i.e. released from the food matrix) (Padayachee et al. 2013, 2015; Parafox-Carlos et al. 2011; Tydeman et al. 2010). The food matrix is in essence the architectural structure of the food and this can impact on nutrient release. Now the role of calcium on bone health is fairly well established. Therefore dairy products are often promoted to be part of a balanced diet as it is a rich source of bioavailable calcium. Simultaneously the consumption of full fat milk, yoghurt and cheese are often discouraged or at the least kept to a minimum due to it’s fat content (particularly cholesterol raising saturated fat). However recent research focusing on the effect of calcium’s interactions with cholesterol production and lipid excretion is shedding new light on the role of the food matrix of different dairy products on cardiovascular disease prevention. Cheese is synonymous with flavour, rich foods, French cuisine and high LDL cholesterol. Nevertheless cheese is also a source of calcium and therefore role of the calcium and the food matrix on cholesterol production was examined recently by University of Copenhagen researchers. The 2014 study looked at the effect of calcium from supplements, milk and cheddar cheese on cholesterol production by examining the effects of three different dairy diets on 15 healthy male subjects. While the base diet was nutritionally formulated to be equal, the control diet did not contain any dairy products and was supplemented with 500mg Ca/day whereas the two test diets contained a higher calcium content (1700mg/day) from the addition of either semi-skimmed milk or semi-hard cheese, foods that also contain SFAs. 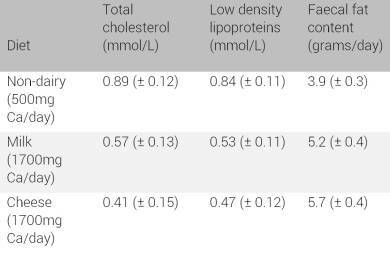 While the higher-calcium diets also contained more saturated fat from cheese or milk, the people on these diets had consistently lower cholesterol levels and passed more fat (Sorensen et al. 2014). All the subjects spent two weeks on each of the diets to allow a complete comparison. The subjects’ LDL and total cholesterol levels were tested, as were the fat levels in their faeces for each two-week period.The result? Despite the higher saturated fatty acid in dairy food diets, participants on the milk and cheese diets showed consistently lower cholesterol levels indicating a decrease in cholesterol production (including LDL cholesterol). Furthermore fat content in the faeces was actually higher in the dairy diets than the non-dairy diet indicative of fat passing through the body than being absorbed. Although changes in blood pressure, lipid ratios and triglyceride levels (risk factors for cardiovascular disease) were minimal between diets, the results clearly indicate that regardless of food source, dietary intake of sufficient dairy calcium is a key factor in decreasing LDL cholesterol production while simultaneously enhancing fat excretion from the body, important in the prevention of cardiovascular disease. The distinct effect of a high calcium intake on decreased cholesterol production and increased fat excretion indicates that binding interactions between high calcium (cheese is notably higher in calcium than milk) and fats in the small intestine are taking place, consequently decreasing fat absorption leading to higher faecal excretion resulting in decreased cholesterol production (Sorensen et al 2014; Huth and Park 2012). So what does this mean in everyday terms to the everyday person? 4) We eat food, not individual nutrients. Calcium is clearly important for more than just strong bones. But how you get calcium into you is equally important. Given that you aren’t on a medically-prescribed diet, and don’t over-indulge (e.g. eat a whole wheel of brie) there is no reason to shy away from the cheese platter. The recommended daily intake for cheese is ~40g – i.e. equal size of a domino. If calcium is a key factor in cholesterol excretion, how does the food matrix affect this behaviour? Why is there a difference between calcium supplements, milk and cheese? I’ll cover this in the next post :-). This article was first published on Pursuit. Previous PostThe fine art of Meal Prepping.